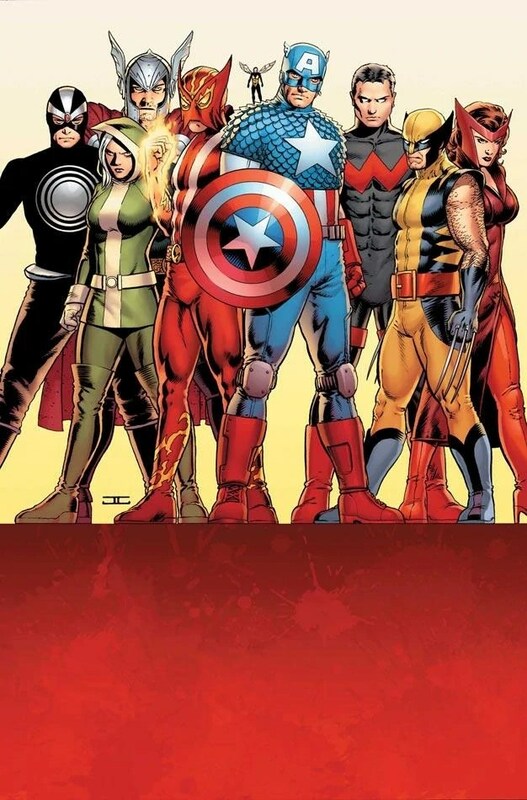 Those of you who were with me during the dark, prehistoric era of 2012, when the world was careening towards an apocalypse as anti-climactic as the end of the Twilight saga, will remember I reviewed the first issue of a series called Uncanny Avengers. Heralded as the flagship title in Marvel’s NOW relaunch, it was a promising beginning to what was hopefully a far better-handled rebooting effort than anything DC could conjure. The series sold itself in the title as being an X-Men (hence the Uncanny) and Avengers title (hence the…Avengers). In the wake of Avengers vs. X-Men‘s disappointing conclusion, a new team of superheroes sourced from New York’s longtime saviours and those weirdo outcast people living in San Fran comes together to defend us from baddies. Their first villain – a retooled Red Skull clone who has implanted himself with the psychically-overpowered brain of the X-Men’s former leader, Charles Xavier. I’ll get this out of the way right now – those of you gunning for a great gateway entry to Marvel, like Hickman’s Avengers title, shouldn’t get your hopes up here. Rick Remender is giving us a series built upon quite a bit of prior continuity, not to mention the massive story he told pre-relaunch in Uncanny X-Force. Those of you not firmly entrenched in the continuity may be left scratching your head through a lot of this book, and thus would probably be better served reading Hawkeye instead. Those of you still here after that will be pleased to know Remender isn’t mishandling the reins on this one. If he’d been the one to write AvX it’s possible we would’ve gotten a far superior story with actual moral dilemmas, since there’s quite a bit of that presented throughout The Red Shadow. When you get right down to it the story is fairly basic – I mean, who hasn’t worn the “mega villain attacks New York” t-shirt and not made it overdone? – but it’s the characters that are centre stage here. There’s a ton of introspection among all the main headliners, and the plot itself actually gets resolved far quicker than I’d’ve anticipated for a lead-in story like this. In fact, in a rare feat for cape comics, the entire final issue of the book almost exclusively deals with the fallout of the preceding narrative and gives a really satisfying denouement with a great sequel hook into the next volume. It’s everything I ask for in a good character study, not just in comics, and it really brings great efforts like Batman and Robin to mind by having an ending that doesn’t entirely resort to fisticuffs for a resolution. That being said, there is one major crime The Red Shadow is guilty of: remember that introspective dialogue I mentioned earlier? How there’s a ton of it? I don’t use that word idly. The number of little white boxes that give us present tense descriptions of what the characters are doing gets a bit ridiculous when they make up more than half the lettering of any given issue in this book. I get that there’s not a lot of room for mouthing off against supervillains when you’re mid-flight or swinging an ancient Norse hammer, and it would’ve detracted significantly from the book’s pacing if the heroes stopped mid-battle for a soliloquy every page, but there is far too much of the mind-babbling going on for me to keep that pace anyway. It’s great that Remender really wants us to know what the characters are feeling, that it’s not just a great big outdoor bar brawl, but there’s a point where you really need to just let some images speak for themselves sans dialogue. It’s something he pulled off really well in Uncanny X-Force, so why can’t we see some more of that here? So the story’s pretty good, the dialogue is fairly snappy (when it’s not in those goddamn little white boxes) and overall it’s an enjoying read. There’s not a lot I can say about the artwork since it’s handled by John Cassaday (responsible for the gorgeousness that is Joss Whedon’s Astonishing X-Men run) and Olivier Coipel (one of the finest Avengers artists in the business), and is thus pretty damn pretty. So go on, read it. It’s pretty good. Sorry if I seem a little distracted in this shorter review, my reading list appears to have somehow evolved into a metric ton and I’m supposed to be churning through them right now. Though my ton of books is certainly bigger than Remender’s ton of motherloving little white boxes.